i wore brown pants and a green sweater today, so clearly i was just asking to be compared to an ent. 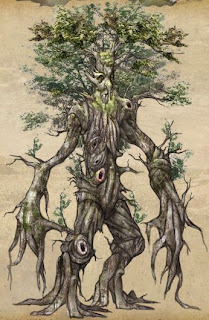 i am proud that i had no idea what an ent was until it was explained to me. sort of diminishes the embarrassment of recently recalling, fondly, out loud, and in front of another living person an episode of star trek: the next generation featuring the borg. so, i remind my orthodontist of a nasty and grouchy overgrown shrubbery. that's alright. i just had my second to last appointment there. instead of bi-weekly, i'll be going again at the end of june, and then i don't have to go back unless some retainer emergency arises. and, i get to stop paying him to torture my teeth. all this, and my snaggle tooth has been tamed. i have found out a small number of things about my orthodontist over the past 3 months - he like sculpting, teeth and wood; he actually carves wood in his free time; he considers himself "earthy;" he is a fan of the lord of the rings; he notices peoples shoes. that's about it. i thought about getting him some sort of small wood carving tool as a little thank you, but then i remembered i just paid him over a thousand bucks and that you can buy a lot of tools with that much money. my bamboo plant, beyonce, has been with me for close to 7 years now. she has spent all that time in a tiny little ceramic cup. recently she looked like death was at her doorstep, so last night i took it upon myself to relocate her to more spacious grounds. i found a simple carafe on sale at crate and barrel for 9 bucks, and a store between work and home was selling some river rocks. the only real trouble was getting beyonce out of her digs. her root system was, well, quite well developed. (she really does resemble the real beyonce in many ways). i had a hard time getting her out of that shell. i thought i might have to break her out. but no, aftert much prodding and pulling, i did free her from the confines of that sarah jo-imposed prison. i found a bunch of floral foam had been holding her in place, and the pebbles just covered the surface. i broke her off in several pieces during this process. she may not recover. but i figure at least she has room to try, rather than the slow and certain death that awaited her. and at the very least, she looks much better now. an airy, clear container with stones versus the grimy old fake antiqued pottery she had been in. if she does die, she does so with great grace and style. wish her luck. 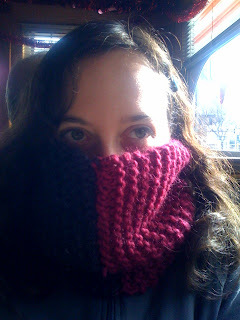 my neck-warmer and i have a mutual admiration club going on. thanks, casey. 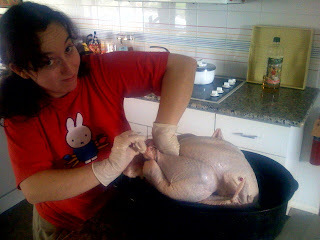 i just found this photo nate took on thanksgiving day of my surprise attempt at preparing turkey. i am simultaneously feeling responsible and up to the challenge, scared out of my brains that it's going to be a disaster, and uncomfortable about getting forearm-deep in a bird from the business end. katy sent me a link that showed up at jezebel the other day about a study being done on a gene connection between long lives and short stature in women. the study is actually on ashkenazi jews. here i was, all concerned that i was out of the most important demographic, and this study shows up. vindication! the post is here - it contains links to two other mentions at science daily, and scientific american. 1. last tuesday there was a deluge of noxious water/anti-freeze from the ceiling at my place of employment. there was flooding. there was mayhem. all that remains of the horror now: a heavily stained and smelly carpet. my office was close to the epicenter, but i am fine, and have a great new story to tell at parties. 2. vades is likely moving back up to the boston area for more schoolin'. she's whipsmart, that one. she will come to the area and bring her strong, bitter, and thoroughly amusing personality to the greater boston area. it, and she, will be welcomed with wide open sarah jo arms. 3. i've been eating oatmeal for breakfast. seriously, this may be the most dramatic news of all. i think i have overcome my pure and unadulterated disgust of hot cereal enough to eat a very sticky version of the stuff. 4. nate will be the second of two residents of "dojo sojo" in a matter of weeks. all manner of emotions have been bubbling up. but mainly a whole lot enthusiasm and joy to be sharing more of my world with nate. and, i am super supremo excited that neither of us will spend large portions of our lives moving back and forth every few days, living like nomads. 5. may i recommend making individual apple-blackberry pies in your muffin tin? you will thank yourself. i used this recipe, but tweaked. i had no lemon, so i used some orange juice. i used black instead of rasp. i used store-bought pie crust. and finally, i had to put a little more flour in the filling because i had no corn starch. the recipe still stood up. of course, you could do almost anything to a pie and you'd be forgiven.